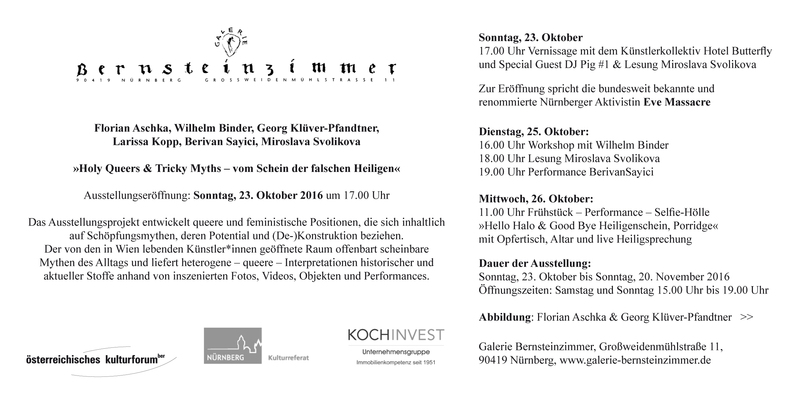 QUEER ENCOUNTERS ‐ VIENNA TRANS L. A. 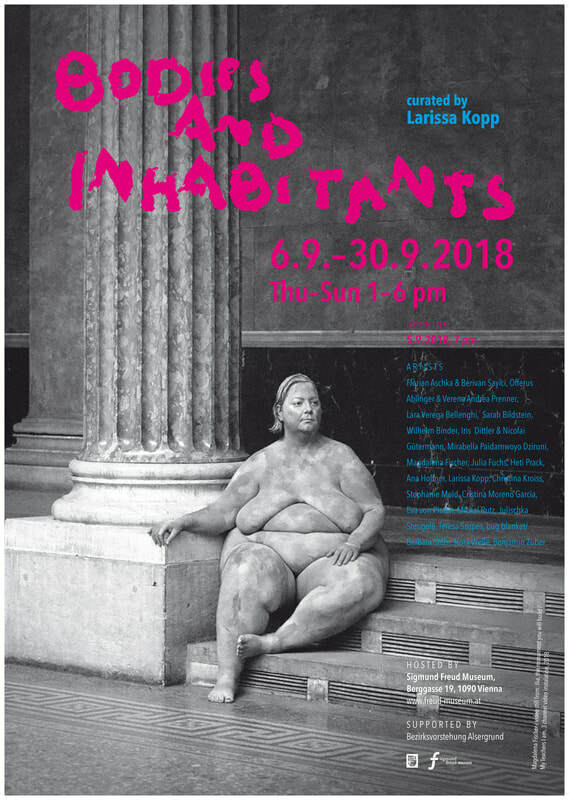 As part of an exchange project between the CalArts School of Art and students of the Academy of Fine Arts Vienna, the exhibition QUEER ENCOUNTERS ‐ VIENNA TRANS L. A. presents around twenty‐five international artists mainly working in a queer‐feminist, anti‐discriminatory and decolonial context. The title of the project refers to the mannerist garden Sacro Bosco in Bomarzo where a sphinx welcomes the visitors entering the site with the following words: “Whoever does not wander through this place with raised brows and lips pressed tightly together would not even admire the Seven Wonders of the World.” The world of wonders that manifests itself in an overall mannerist concept challenges its vis-à-vis to creatively and actively intervene in the circumstances given and engage in their highest form, artistic expression and understanding. The garden as a site of the manifestation of – and the debate on – artificiality, the disintegration of existing systems, and the reassessment of given hierarchies will be defined and discussed in a contemporary vein: (trans)mannerism may be understood as absolute empowerment on the basis of breaking away from the prevailing conditions and the creation of a physique of one’s own. Flamboyant: being a cyborg and rooted in creole is what the manifesto amounts to. PERFORMANCE ART can happen anywhere and for any length of time. RAPID PULSE approaches performance from a visual art perspective. As a potter uses clay, a performance artist uses the body, object, and space to sculpt time-based works of art. At once beautiful or grotesque, meditative or thrilling, solemn or funny, performance art ranges from explorations of the mundane to embodiments of edginess, risk, or pain. MARILYN ARSEM (US). JELILI ATIKU (NIGERIA). ATOM-r (CHICAGO). YOLANDA BENALBA (SPAIN). SARAH BERKELEY (US). JOHN G BOEHME (US|CANADA). MARY COBLE (US|SWEDEN). JOHN COURT (FINLAND). CHUN HUA CATHERINE DONG (CANADA). AYANA EVANS (CHICAGO). VIVIAN CHINASA EZUGHA (NIGERIA|WALES). ADAM GRUBA (POLAND). MIAO JIAXIN (CHINA|US). NATASHA JOZI (PAKISTAN). LARISSA KOPP (GERMANY|AUSTRIA). PARIS LEGAKIS (GREECE|US). SARA MORAWETZ (AUSTRALIA|US). AMITIS MOTEVALLI (IRAN|US). LECHEDEVIRGEN TRIMEGISTO (MEXICO). JULIE POTRATZ (CHICAGO). VICTOR de la ROCQUE (BRAZIL). BERNARDO STUMPF (BRAZIL). MITSU SALMON (CHICAGO). MARCEL SPARMANN (GERMANY). MARYAM TAGHAVI (CHICAGO). MARTINE VIALE (CANADA). WEEKS & WHITFORD (UK). FRANCIS MARION MOSELEY WILSON (US). TORI WRåNES (NORWAY).